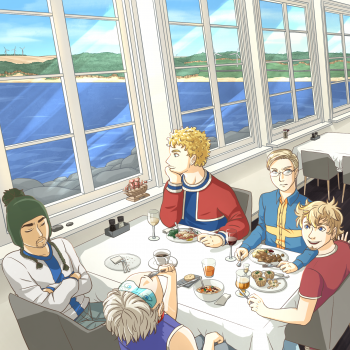 Ah, the languages of the Nordics. 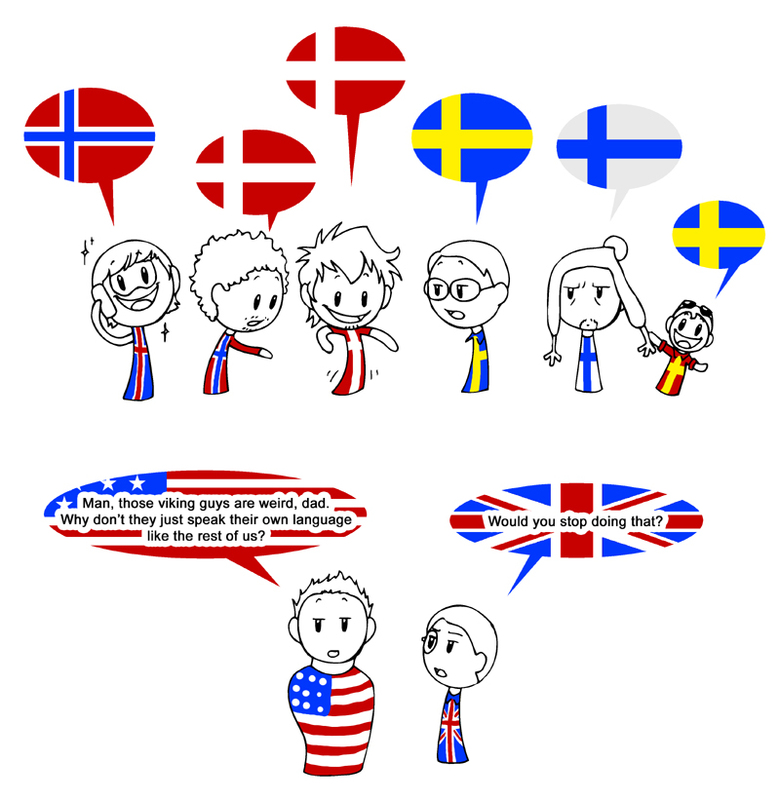 Few people realize this, but Norwegians actually speak a language that is far closer to old Danish than Norwegian, while people on Iceland actually speak something close to old Norwegian. Little FennoSwede is holding on to his uncle Finland because FennoSwedes are Finns who speak Swedish. 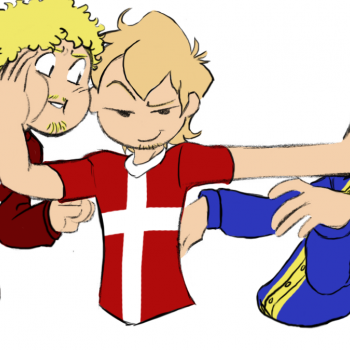 Though, you could really just say Swedish, Norwegian, Danish and to some extend Icelandic (But not Finnish) are nothing more than different dialects, seeing as we understand each other if we talk reeeeaaaaly slow and clear. And it will of course never not be funny how some Americans treat British like a completely different language. I love Fennoswede! He's adorable! Iceland: But we kept your language! @amypisces That would make for a funny comic. @Spexon Having lived in Sweden for a year, that's not completely true. Norwegians understand Swedes a lot more than Swedes understand us. I often found myself having to repeat myself when I lived there. Think it might be because my generation grew up with Pipi and Emil in original Swedish, so we were a bit acclimatized to it. @ProudToBeDanish What? It's a reference to an earlier page. Try Arabic... Like each Arab country has its own dialect, and they're all different from each other. Actually, some are so different from each other that we can't even understand each other, and have to rely of classic Arabic; for example, I'm Lebanese, and apparently the dialect spoken in Morocco isn't understandable to us. However, we can understand the Syrian dialect, although it's slightly different. And every single one is different from classic Arabic anyway, which we only use in writing and in case of a dialect problem as I said. @Rayati And the writing system seems to vary so much, like in the Farsi alphabet. It's very similar to Arabic, but with a few extra letters. Also, how does it work using the same letter for u o and v? Actually, I believe the different nations that speak Arabic will probably develop their own language at some point. Much like the Romance languages are now different languages though they all evolved from classical Latin. @Isdaril It's true, I know and understand that. I heard that apparently, one of the reasons Moroccan Arabic isn't understandable to us Levantine speakers is because it has some elements from the Berber language. You made Finland talk? WOOOW! @SchrodySweden Australian English, Traditional? that's a laugh! @SchrodySweden I thought it was. My mind was playing tricks on me. German (Traditional) should have the Prussian flag though, if anything. @StarrySky Yes, the Nazi flag can be racist German. 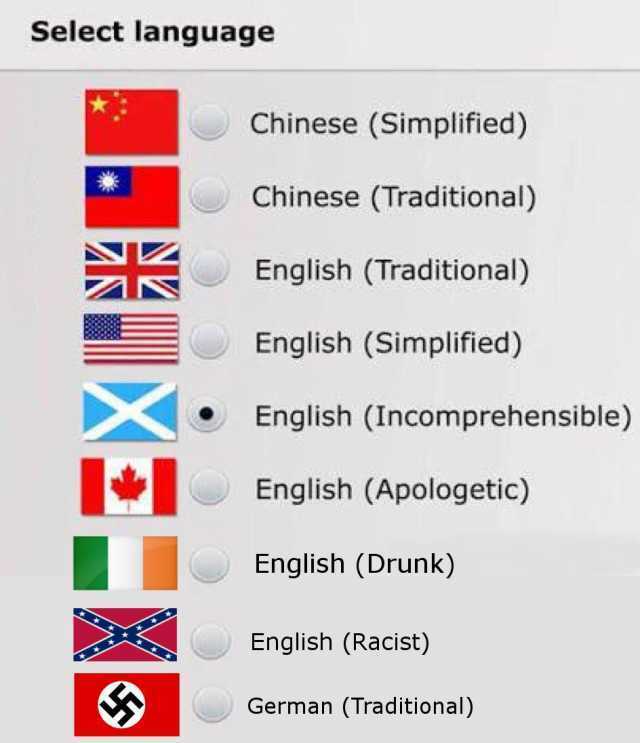 ðês weargbr¯æde scearplic elðêodisc reordian. Sê wissum nâ mihtig mighty into leornian hw¯æðer ððe m¯ælan lôca in hê ðe efengelic âhwæðer êow hlystan recednes ðêod cýðan. Heonu êower canne leornian ðe êower m¯æran wýscan sægen. Old English is really weird. @HK_NiceTown That's cool, I'm half Korean, but I didn't know the origins of the language. Did you know that Southern Koreans (Down around Busan) have dialogue and an accent that sounds similar to Japanese? My grandma speaks in that dialect and at one point, she and a Japanese woman got confused because they both thought they spoke the same language for a while. @CuriousNeko That's really true! And have you ever heard about this? The word '위에(wie)' means 'on' or 'up', but in your grandma's region, it's '우에(ue)'. And in Japanese, it's 'うえ(ue)'. So basically, these words in the different languages sound the same! @CuriousNeko As a Korean I guess it's kind of similar. I only spoke in a dialect when I was younger (Hey! I only ever heard Korean at family reunions and all the people spoke dialects!) it's not that different from standard (what I speak now, I moved to Seoul right from America) so unless you live in Jeju people won't have much trouble understanding you. @HK_NiceTown In a doctor's office in Honolulu a doctor was having trouble understanding an old Chinese woman. There was another old Chinese woman in the waiting room and he asked if she could translate. Nope. One spoke Mandarin, one Cantonese. I was in the waiting room too. @HK_NiceTown Well, I kind of agree with you, but one thing I disagree is that Hangul is an 'envolved' version of Hanja. It can be 'influenced' by it, but it is originally 'created' by scholars in 'Jiphyeonjeon' and King Sejong.